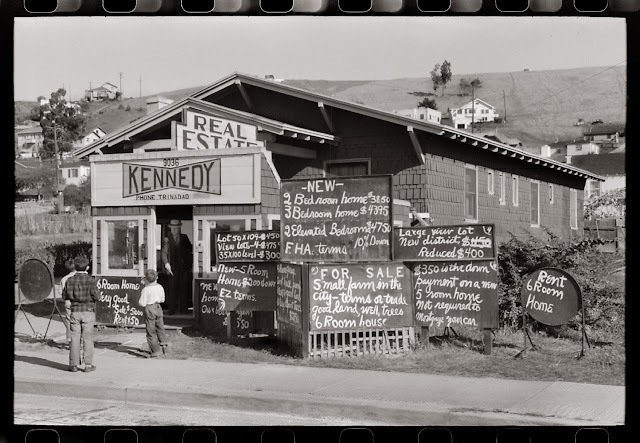 California Images: Like to buy a 6-room home in the Oakland Hills for $4,750 ? Like to buy a 6-room home in the Oakland Hills for $4,750 ? OK. Time travel is required. But, what of the ratio of affordability? income to price of real estate? The Oakland Hills in 1940 were largely undeveloped. Gradually building up by district, many factors encouraged growth, the new Bay Bridge, the East Bay's exceptional commerce position from rail and water transportation, excitement following the 1939 Golden Gate Exhibition, a celebration of Peace in the Pacific ironically given the events of 1941, and rapidly developing industry throughout the area. It did not hurt that you could buy a view lot for $400 view lots or a finished home for $4,750. Interestingly, this Realtor is pitching his properties with a tag line that you will "Not have to mortgage your car" to buy a home. Love seeing this I think my parents bought their home from this guy. for 4500.00 on broadway terrace. Last time I checked it is worth 995k.